Royal legend , it is twenty years of a faithful friendship, between Marie Antoinette and the Chevalier of Eon, imagined in a few letters, from the first steps of" the Austrian "on French soil until its last steps on the scaffold. What unites so strong the fearsome eccentric knight and the grave and frivolous queen? A certain ambivalence, a same fate of pariah, sometimes covered with gold, sometimes by hatred? In this room, the years before the French Revolution are observed by the keyhole, from the intimacy of two witnesses lost in a suit that does not fit them. 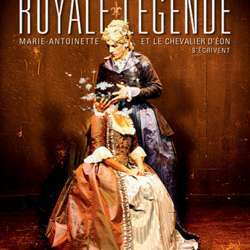 "Royale legend" is an offbeat glance at a collapsing world, a bubbling rambling on history, the encounter of two human beings in their intimacy, their complexity, and the heartbreaking narrative of their downfall.